There are many solutions to postgresql replication available in the market. Almost all of them are third party solutions, since there was no inbuilt replication in postgresql. Postgresql 9.0 introduced replication into the database – it is also known as streaming replication.And it can be used only for master-slave replication. There is no master-master or clustering feature available with postgresql SR (streaming replication). The way SR works is that there are log files (known as XLOG files) which are shipped to the standby or slave server via network. Multiple slave servers can connect to the master over the network. The stand by servers continuously replay the XLOG records shipped in continuous recovery mode.As soon as XLOG files are shipped, they are replayed on the slave. This makes latest data available on slave almost immediately. Log shipping does not interfere with any query execution on master. In case the primary goes offline, the standby server will wait for the primary to become active. Here is how i did a test setup of master-slave replication using postgresql. I had 2 machines 241 and 242. I downloaded postgresql-9.1.1.tar.bz2 on both. Do not start the postgres database server now. 3. configure master server to listen on all ip addresses. # server in standby mode. # Set the maximum number of concurrent connections from the standby servers. # segments required for the standby server, this is not necessary. This will also copy all the configuration parameters and authentication related stuff from primary to standby slave. Ensuring that the slave can be converted to a master/primary in case of a failover. 9. Enable recovery on the standby server and change configuration. # end (i.e., failover). Once the trigger file is found the server acts as a primary server. 10. Start postgres on standby server. This will start streaming replication on the standby server. To do a failover, all that needs to be done is to create the ‘trigger’ file at the specified location. This will automatically turn off standby mode and the postgres server will start acting as a primary or master. Do remember to use the “pg_ctl stop” command to stop either the primary or standby server. This will ensure graceful shutdown and no records will be missed being replicated. Please refer to http://www.jayantkumar.in/index.php/2010/09/29/database-speed-tests-mysql-and_29/ and http://www.jayantkumar.in/index.php/2010/09/27/database-speed-tests-mysql-and-2/ for benchmarks of selects and inserts respectively. All test runs were individual – meaning that only one script was run at a time with different count and concurrency. For inserts $count was set to 10,000 and for selects $count was set to 100,000 while $concurrency kept on varying. I am using ubuntu 10.04 with 32 bit kernel 2.6.32-24 and ext4 file system. And my system has around 3GB of RAM and Intel Core 2 DUO T5870 @ 2.0 GHz. Here is the comparison between mysql and postgresql for selects (only). I had used the same table that i had created earlier http://www.jayantkumar.in/index.php/2010/09/27/database-speed-tests-mysql-and-2/ while comparing insertion speed. I have created approximately 1,000,000 records in the table and ran selects on them. I also modified the configuration of both mysql and postgresql to enable faster selects. he query cache is marked as dirty. So enabling query cache would lead to caching of queries which will not be the scenario in a live setup. Mysql has better table compression as compared to postgres. Same data in innodb is of around 700 MB while that in Postgres is of around 900 MB. Mysql seems to perform better with selects. The graph also shows that with increase in concurrency, selects in innodb take lesser time than that in postgresql. So, why would you switch from mysql to postgresql – only if you have a very high ratio of inserts as compared to selects. The benefit in inserts outweigh the loss in selects to some extent. There has been major changes in mysql and postgres over a couple of years. Mysql has been focusing on improving and optimizing innodb. Postgres on the other hand has been focusing on database replication and hot standby. I have created a simple php script to perform the benchmark. Which spawns out multiple php scripts that work on background. Let me know if you need the scripts and i will share it with you. 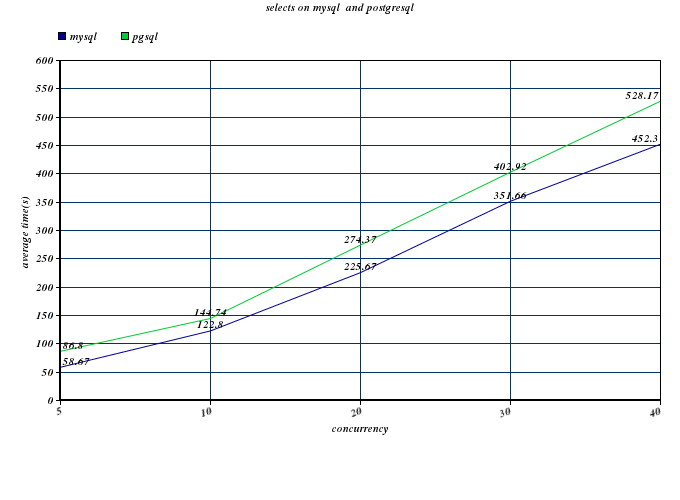 The graph shows that mysql is heavy as compared to pgsql. 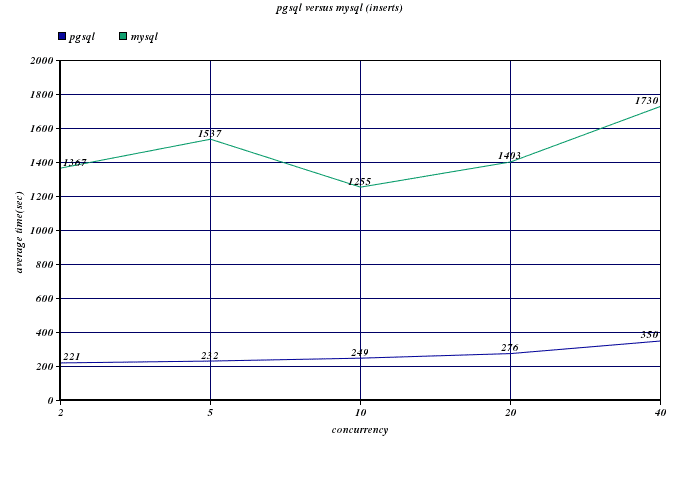 The base timings are almost 5 times more in mysql as compared to pgsql. Also as the concurrency goes up the time required for inserts in mysql spikes up more steeply as compared to that required for postgres. Lets see what do the selects tell – in the next blog. You can alter the following settings in the config for better performance of postgresql. # another way of getting this number is using the EXPLAIN ANALYZE query. If the plan shows “sort method: external merge disk: 7532kb”, then work_mem of 8Mb can do wonders. # same as work_mem but for vaccum, alter, other ddl qry. # default 8 KB. 1 MB is enough for large systems. # After every transaction, pgsql forces a commit to disk out its write-ahead log. # generally switched to open_sync, but it is buggy on many platforms. # Should be benchmarked with very heavy query, before switching. # recomended to 1/2 of available memory. On unix can be set to free+cached from “free”. # by default 3*16MB per segment = 48 MB. Can be resource intensive on modern systems. # Synchronous commit introduced in pgsql 8.3 allows a small amount of data loss (in case of failure) for large boost in number of updates on the database per second. # you can bring down the random page cost to 3.0 or 2.0. # setting this variable lower will encourage the query optimizer to use random access index scans. Eventually postgresql comes out with its inbuilt replication solution in 9.0 beta. Setting up of replication is quite simple. We will look at setting up a simple master-slave replication between two servers of postgresql. The way replication works in postgres is that the master keeps on writing “write ahead log” files (also known as wal files). The slave can be configured to run either in recovery mode or hot standby. The difference being that in recovery mode the wal files require to be shipped using something like a cron. And the slave applies the wal files to its database. The problem here is that it is not smooth and the delay between master and slave can be big. The logic of hot standby is that the slave connects to the master and fetches the log files from master. And it applies those log files on its database. Here the lag between master and slave is not huge since the slave tries to keep up with the master. This is also known as streaming replication because the wal files are continuously shipped to the slave and applied there. There could be multiple slaves fetching wal files from master and applying to their own database. As opposed to mysql the slave here is readonly – it cannot be modified. It can be used only as read-only slave for select queries. Initialize the data directory on master. No need to initialize it on slave – since we will be copying the master directory to slave for starting replication. In case you are trying to create a slave of existing postgres database, you can simply skip these steps and install postgres on a slave machine – and not initialize the data directory on the slave machine. Change config on master so that any slave is authorized connect to the master. Add the following line to pg_hba.conf of master. This says that 172.16.3.211 (the slave) is allowed to connect to master for replication without any password. Configure this for all slaves (if you plan to have multiple slaves). Change parameters on the master postgresql for streaming replication. # allow all ip addresses to connect to the master. # set wal_level for hot standby replication. # set the minimum no of WAL segments to be retained in the pg_xlog directory from where the slave can pick up the WAL segments. # This prevents removal of WAL segments before they are shipped the slave. Start postgres on primary/master server. Create a backup of master and ship it to the slave server. Clean the data directory in slave and set replication parameters. Here the postgresql.conf is same as master, so just set the parameters required by slave. # shell command for copying log files back from the archive. Should not be required. # stop streaming and enable the server to work in read/write mode, if this file is found. # server keeps on polling for the trigger file and stops replication once this file is found. The server can then be used in read/write mode. Start postgres on slave. It will start streaming replication between master and slave. That is it. Run a few DML/DDL queries on master and check if they are being replicated on slave. The lag between master and slave is not noticable. As most postgresql users must be knowing, postgresql does not provide any inbuilt replication solution. There are lots of 3rd party replication products available for postgresql. Slony is one of them. Slony is a trigger based replication solution, that is it used triggers to push data to the slave. Slony is supposed to be one of the most stable replication solutions for postgresql. You can download slony from www.slony.info. There are two major versions of slony – slony-I & slony-II. Slony-I is a simple master-slave replication solution. Whereas slony-II is a advanced multi-master replication solution. We will go ahead with simple master-slave replication solution. So we will download Slony-I. The latest version available is Slony-I 1.2.15. Slony-I 2.0 is in RC and should be soon released. But we will go with a stable release – 1.2.15. I have used two machines for setting up replication. Installed postgresql and slony-I on both of them. We will be working with the superuser postgres which is used to start and stop the postgresql server. Define environment variables on master & slave. The main purpose is to make our task easier. Lets create an env.sh file containing all the definitions. As you can see here, my postgresql is installed in /usr/local/pgsql. I have defined the IP addresses & ports of master and slave servers. I have used the superuser postgres for replication. And i have defined the master and slave databases to be used for replication. You can replicate between databases with different names on master and slave – just change the names in all the scripts. Since slony-I depends on triggers for replication, you will need to install the plsql procedural language on master to generate and run triggers & stored procedures for pushing data to slave. Put some tables in the $MASTERDBNAME on master, which you want to replicate. And port the tables to slave. It has to be done manually. And now configure the databases for replication. When you install Slony-I, it puts two binaries slonik and slon in the pgsql/bin directory. Slonik is the tool which is used for creating configuration tables, stored procedures and triggers. All we need to do is create a configuration file to pass it to the slonik tool. Here i am assuming that there are two tables which need to be replicated – parent & child. # Add unique keys to table that do not have one. # This command adds a bigint column named “_Slony-I_$CLUSTERNAME_rowID” to the table which will have a default value of nextval(‘_$CLUSTERNAME.s1_rowid_seq’) and have UNIQUE & NOT NULL constraints applied on it. # subscribe is a set. Pass the config file to slonik for creating required triggers & config tables. Passing this file to slonik will do the trick and replication would start happening. Now simply make some inserts, updates and deletes on the master and check out whether they are happening on the slave as well. Officially, since replication is on full swing all changes in master tables should be replicated on the slave. Please note that new tables & changes to table structures wont be replicated automatically. So whenever a new table is created or an existing table is altered the changes has to be manually propagated to slave and the scripts need to be run to make appropriate changes in the triggers and config tables. Another important thing to note is that postgresql on master and slave should be able to communicate with both the ip addresses. For this add the ip addresses in the pgsql/data/pg_hba.conf. to the pg_hba.conf file in both master & slave. My earlier post mysql versus postgresql brought me lots of negative comments – that i did not compare the transactional database of pgsql with the transactional engine (innodb) of mysql. The main reason why i did not do that was because i had found InnoDB to be very slow as compared to MyISAM. But after all those comments i ran the benchmarks again using the same scripts and the same technology on the same machine (my laptop) and here are the results. I created a new table in both Mysql (using InnoDB engine) and pgsql. And i disabled the binary logging in mysql to speed up insert/update/delete queries. Please refer to the earlier post for the setup information. So disabling binary logging in mysql would make your insert/update/delete queries take half the time. Inserts in mysql are very fast. Had 4 runs with different no of threads. So, it can be said that for a small system with less concurrency, mysql would perform better. But as concurrency increases, pgsql would perform better. I also saw that while running the pgsql benchmark, the system load was twice than while running mysql benchmark. Enabling mysql binary logging for replication would ofcourse add an over head. Similarly enabling trigger based replication in pgsql would be another overhead. The fact that replication in mysql is very closely linked with the database server helps in making a high availability system easier. Whereas creating slaves using replication in pgsql is not that easy. All available products for replication in pgsql are external – 3rd party softwares. Still, for a high concurrency system pgsql would be a better choice. I created and ran some simple tests on mysql and postgresql to figure out which one is faster. It is already known that postgresql is more stable and reliable than mysql. pgsql has a rich set of features. It is a complete RDBMS and also supports fulltext search. All benchmarks were done on my laptop – Intel core 2 duo (2.0 GHz) with 4MB L2 cache & 2 GB ram. I have 64 Bit ubuntu system loaded with MySQL 5.1.24-rc (64 bit binary) and PostgreSQL 8.3.1 (compiled from source). I used python as a scripting language for writing down my benchmark scripts. I used psycopg2 as a connector from python to postgres and mysql-python as a connector from python to mysql. The benchmarking was done in phases. Firstly simple Insert, update and select queries were run to check the raw speed of these queries. Then threads were created to run simultaneous insert, update, select and delete queries. I checked the benchmark times for different number of concurrent threads. Mysql looks better in handling updates here. These runs show that Mysql is good when you have very large no of inserts/updates/deletes as compared to selects. But pgsql’s performance surpasses that of mysql when the number of selects are much higher. Finally, lets approach the real life scenario where generally the number of selects are much more than the number of inserts and there are multiple threads performing selects and inserts. Both Mysql and Pgsql are almost at par. Run 3 : [4 X 50000 selects, 4 X 40000 selects, 2 X 30000 selects, 2 X 20000 inserts, 3 X 15000 inserts, 3 X 15000 updates, 2 X 3000 deletes] Total – 20 threads (10 threads for select, 5 for insert, 3 for update and 2 for delete) Which is the normal trend in database servers. Bingo, so as concurrency increases pgsql becomes faster than mysql. My earlier benchmarks with pgsql 7.x was not as good as this one. With postgresql 8.3.1, the speed of serving concurrent requests has increased a lot. So, in a high concurrency environment, i would generally recommend to go ahead with using postgresql rather than mysql. Why? In brief, it is said that mysql is not as stable as postgresql. Postgresql or pgsql focuses on a single database engine as compared to mysql which has a pluggable engine architecture and has multiple engines. Also postgresql is well designed as compared to mysql. psql console is much better than mysql console (you will realize it when you use it). It is supposed to be much more scalable and have better performance than mysql. Pgsql uses a more standard sql language as compared to mysql. Both have fulltext search capabilities. Though it is said that the fulltext search of pgsql is better than mysql, but i still have to look into it. And the most important of all – pgsql is a full fledged RDBMS, whereas mysql (using the default MyISAM engine) is a DBMS. Data integrity is better in pgsql as compared to mysql. Also i have seen lots of corrupt tables in mysql(might be because i have used mysql throughout my career), and have heard(on the web) that mysql is more crash prone than pgsql. The final question then comes down to speed. Which one is faster? Logically, since mysql is a DBMS and it does not maintain foreign key relations, it should be faster than pgsql. I will benchmark and blog the results sometime later. Basically, pgsql is more stable & reliable than mysql. Pgsql has a rich set of features and data integrity is well maintained in pgsql. First of all, down the database engine from www.postgresql.org. Untar it and compile it. You will see here that the character set for the database & server is latin1. Even though the default database is utf8. If you create the pgsql database using the default command, it will create a utf8 database and you will face problems importing your data into it. Now you have postgresql installed and you can create your own databases and tables. But before proceeding forward, do psql from user postgres’s shell. Welcome to psql 8.3.1, the PostgreSQL interactive terminal. The =# says that you are logged in as a super user. To login as another user, create another user and give him required privileges. And then su to the user and login to pgsql from that user. Here => says that i am not a super user. Now i can create my tables in the test database or create more databases. To convert your table from mysql format to pgsql format, just dump the table and data separately from mysql using the mysqldump –no-data and mysqldump –no-create-info respectively. download a perl script mysql2pgsql.perl which will be able to convert the sql for your table into appropriate format for pgsql. This would also create a sequence mytable_id_seq. While importing data from the mysql dump you may get some warning about backslash escapes in your sql. To remove this warning you will have to set the escape_string_warning to off. edit your postgresql.conf file which can be found in the /usr/local/pgsql/data directory and change the variable to off. Now restart pgsql. Another thing to note is that you dont have custom queries like ‘insert ignore into’, ‘replace into’ or ‘insert into … on duplicate key…’ in pgsql. You will need to create rules on the table to handle these cases. So for exampe to create an insert ignore into type of rule, the following rule needs to be created. Remember SHOW PROCESSLIST of mysql which used to list down all the processes. We will looking more and more into pgsql.